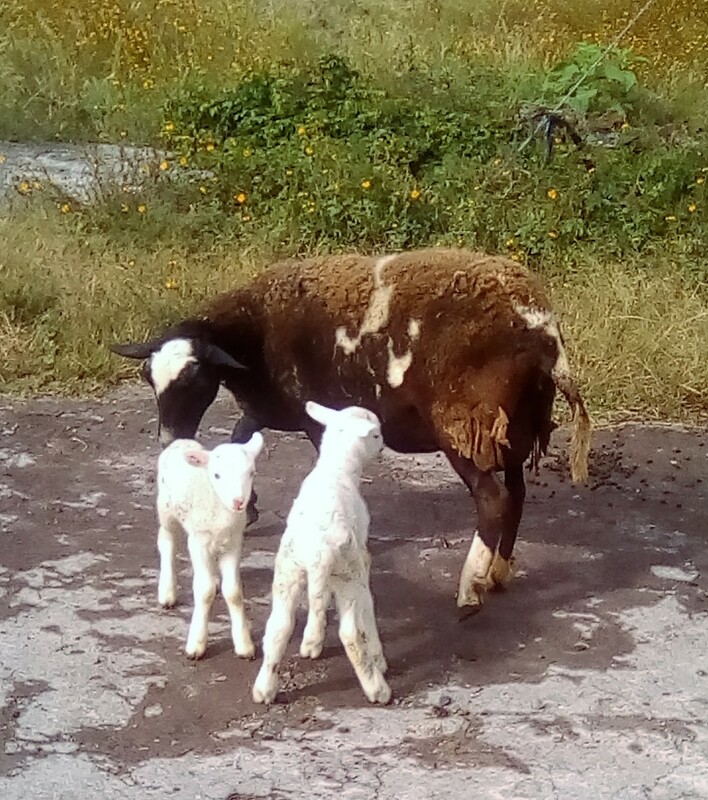 Apparently, the birth of the last pregnant ewe on our compound was the catalyst to sell, sell them all, for my husband. Of course, the outstanding debt on Cookie, the pregnant mare, was another incentive. Anyway, Preggers had two cute little lambs, a boy and a girl, but my husband wasn’t happy. They seemed to be more Pelehuey rather than Charol, meaning they didn’t have the fluffy fur of the mama and must have taken after the dad. Not like my husband has ever sheared the sheep we’ve had now for a year, so what difference does it make if they had fuzzy wool or not? Anyway, mama and babies went to live with the neighbor down the road. They seem happy enough when I see them occasionally romping through the underbrush in La Yacat. So then ALL the spare machos had to go. That meant the Borrego Boys, the Chivo boys, Salt and Pepper, and Payaso the one singleton in this bumper crop of twins, were loaded up in the back of the truck and headed to Puruandiro. Although it took all day, everyone was sold, most to become the head mucky muck of their own herds, since the macho needs a’changing every few years to minimize inbreeding. Some women I know subscribe to this philosophy as well, but that’s another story. So that left Zombeta all alone in the back corral. I convinced my husband to move her to the front area so she wouldn’t die of loneliness. Her pitiable bleats were hard on my heart. He did, onto our “patio” that is Cookie’s corral as well. Zombeta was happy. A few days later, he found a buyer for Zombeta and we are now sheep-free. She lives now at another neighbor’s who has sheep and seems well enough. Then disaster struck. The mama of the triplets took sick. The whole side of her face swelled up. We went to the animal clinic who said it might be a tumor. Since it happened overnight, we thought it was more likely a bite from something. 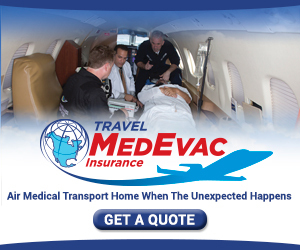 They gave us some pain medication and sent us on our way. I suggested that it might be something the rats dragged in because boy do we have rats this year. They have even managed to find a way inside the house. No rat trap has been able to capture a single one. During the week mama goat was sick, my husband managed to kill 15 small mice, although some committed suicide in the water trough, and one HUMUNGOUS ROUS (rat of unusual size) outside, but, you know, there’s always more. Mama goat died. We had quarantined her and the triplets to the back corral. We moved the orphans back to the main goat coral and bought some milk. Unfortunately, two days later, Spot died too. Now we thought it might be ticks. When my husband checked animal ears, sure enough, monstrous ticks. He spent the afternoon plucking them out of the ears of goats, dogs, and horses. Then everyone got some powder in the ear and bath. That seems to have done the trick. No one else has died although this morning, it seems like Bunny, one of the triplets doesn’t want to eat. That doesn’t bode well. We are trying to stay on top of these mouse and tick infestations and so far are ahead of the game. Now, we are just waiting for Cookie to have her baby, it ought to be any day now. 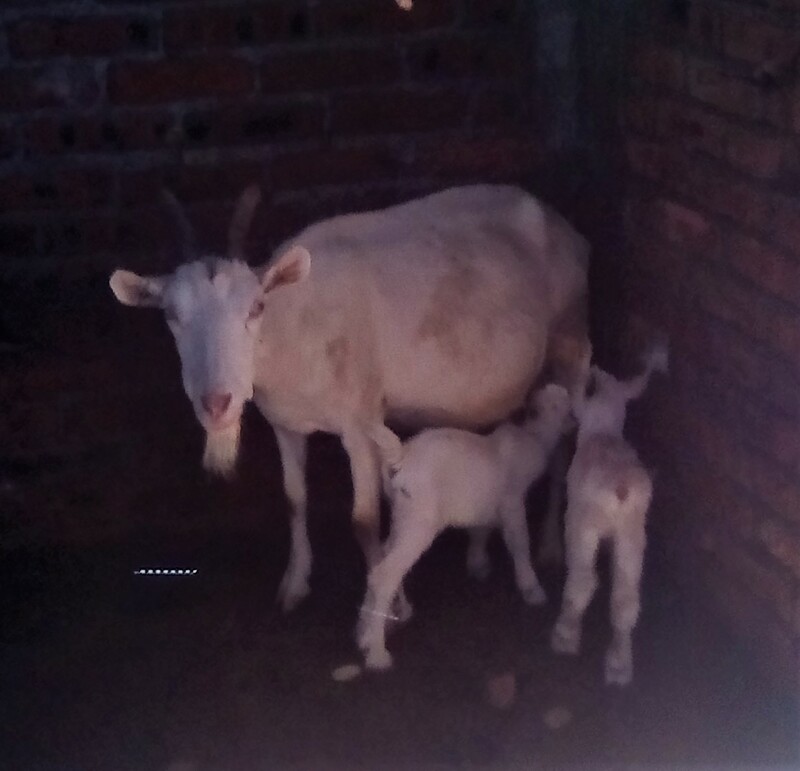 Well, that pregnant goat my husband bought last finally gave birth–and to triplets no less. Two boys and a girl as cute as can be. They are just as lovely as Chiveta–making them way better looking than the kinder boys we have running about. One of the boys is Spot because he has yep you guessed it, a spot on the back of his neck. The other we really haven’t named, except to say Not Spot, so maybe that’s his name. We can only keep one of them anyway, so best not to get too attached. The girl we’ve decided to call Bunny, which was also the name of a lovely twin that got goat-napped a few years ago. Let’s hope that doesn’t happen again. Meanwhile, he’s gone and bought a pregnant mare. Our horse Lady is just 2 years old and won’t be ready to breed for a while. I’m pushing my husband to wait to breed her until she is three, but she may go into heat this summer. Anyway, back to the new horse. The guy up the hill had 4 horses which he let run semi-wild in an overgrown area. He’s decided 4 is too many so wanted to sell one. My husband immediately decided this was the horse for him. I asked him to wait until I saw it, so Sunday afternoon, he dragged me hither and yon to hunt down the horse. Eventually, she and her herd buddies were located and my husband brought her to the fence to meet me. I estimate she’s about 10 years old, although the owner is saying she’s only 8. A lady never tells her age anyway. This is her third pregnancy and it’s quite advanced. I think she’ll have her foal before the month is out, but my husband says not yet. I also think it will be a boy. So we’ll see what happens there. She’s a nice docile horse. My husband says she “my” horse but that’s not really true. She and Lady have decided that they can be friends. Since I’m in charge of the naming around here, she’s been christened Cookie. She’s mostly white with a salt-and-pepper mane and tail with black freckles all over her face. My husband had to go and get her that very afternoon even though he hasn’t finished paying for her because he was concerned there wasn’t any water where she was being kept. And it’s been SO hot the past few days. He and my son led her down to our house and she drank 3 buckets of water, so she was thirsty. Our population explosion isn’t quite finished. We are still waiting for the pregnant ewe to give birth. My husband keeps saying any day now. Would you like to read more about our animals? These days I have no idea what my husband wants to raise, sheep or goats because we certainly do not have the space to raise both species. Nor the patience. When the herd/flock are taken out to graze, they segregate themselves and the work to keep them safe from roving wild dogs, snakes, and poisonous plants is doubled. So one Sunday my husband comes back from the grazing and says he’s sold the sheep to the neighbor. Zombie, Fuzzy and the others are gone in a few minutes, leaving us with just the Borrega boys and Zombeta. With the cash in his hot sweaty hands, we head to Cerano that very afternoon to find a macho for our goat herd. We have lots of boys, but nothing close enough in maturity to fulfill any husbandly duties when the next heat cycle comes around later this month. We happen across two herds of about 200 goats grazing in a recently harvested corn field. My husband does some tough negotiation and buys this young buck, quite a looker, for our fair ladies back home. Having some extra cash, he haggles for yet another pregnant goat. He wanted a third, but just didn’t have the cash to complete the deal, so home again, home again jiggidy, jig we went with Macho and Prego. 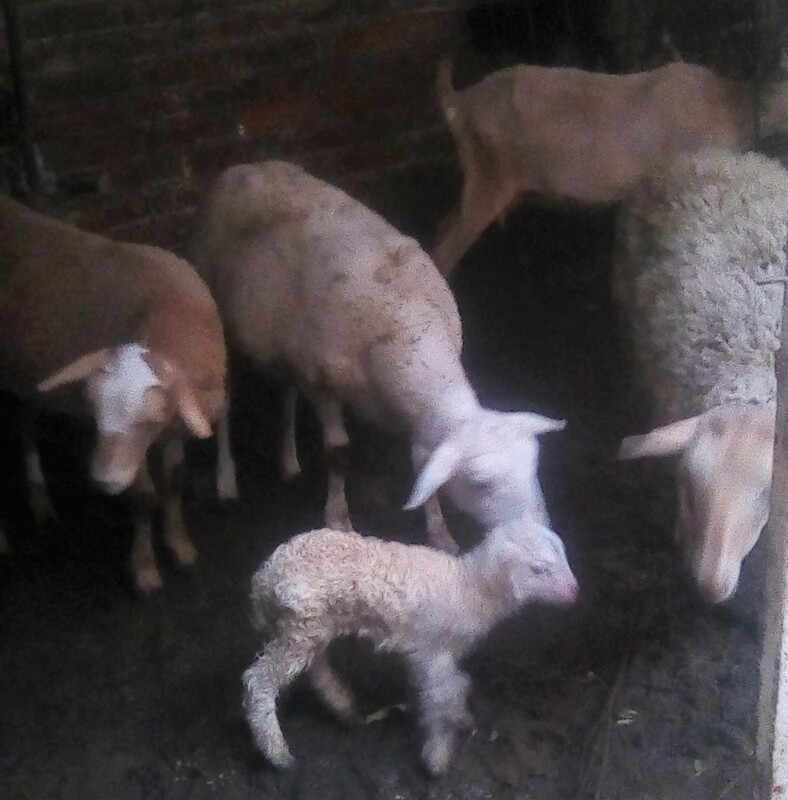 The three little sheep, Borega Boys and Zombeta, were allowed free run of the patio area, even had their own little feed box, so that they could grow up healthy and fat. Of course, this meant that the patio was full of sheep pellets as a result of their ample diet. Fun right? I thought we were done with sheep acquisition, but NO! Since my motorcycle has been on the fritz and there hasn’t been any gas anyway to fill to the tank, my husband found a buyer willing to trade sheep for it. So in addition to the three little sheep, we now have one pregnant ewe, and one who had recently given birth to twins, so 4 sheep with one on the way, making our grand total 7 sheep (and a half). The poop pellets on the patio were getting out of hand, so my husband went to work at revamping Miss Piggy’s bungalow in the back. The first attempt failed utterly. 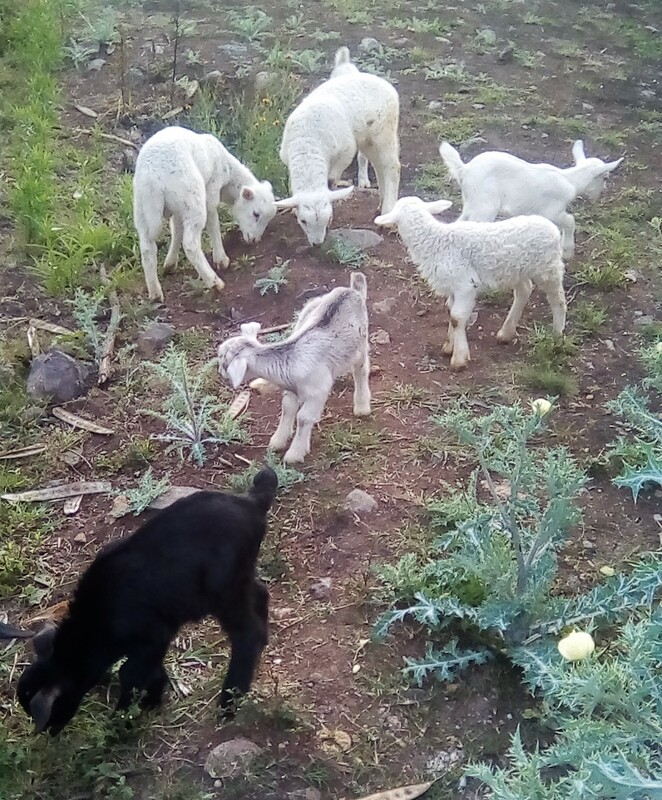 These are Mexican sheep after all and no little wall was going to keep them from the promised land (in this case, my backyard full of tasty plants). So he had to install barbed wire around the perimeter and that seems to have done the trick. To keep them shaded, he rigged a wire/branch roof which in a few weeks will be covered in chayote leaves, making a nice little palapa for everyone in the sheep compound. Of course, I’m hoping in a few weeks, we won’t have any more sheep, but you can see how this sheep thing keeps going and going. The mama sheep with the twins has been sickly since we’ve gotten her. Malnourishment and a rough delivery are the probable causes. 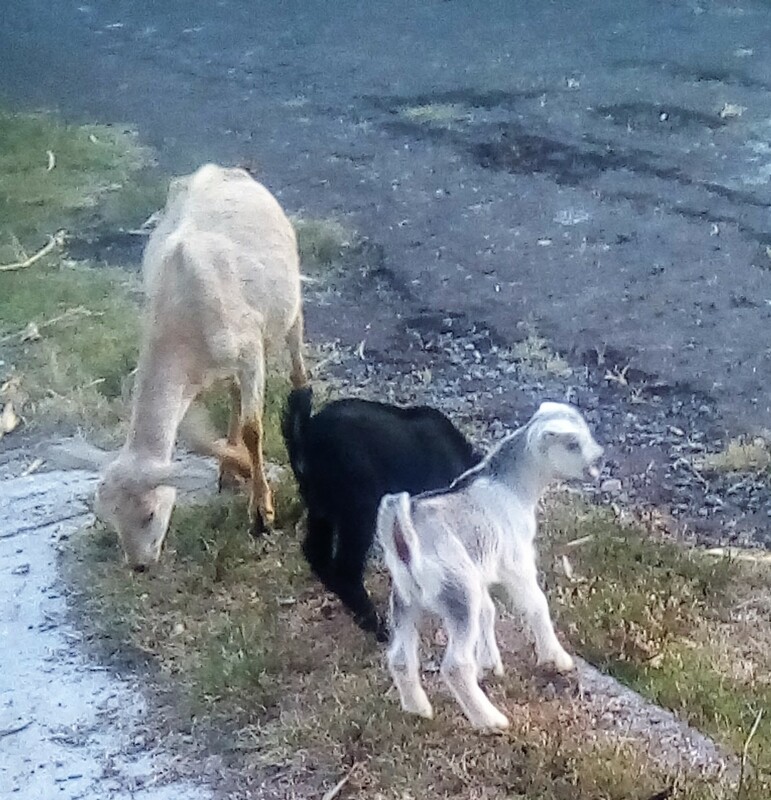 My husband, Papa Chivo, has been bottle feeding the twins goat milk to supplement their diet and they are more lively. The mama gave us quite a scare when she stopped eating for a few days, but some tempting greens and some olive oil brought back her appetite and she seems to be getting stronger as well. So here we are being overwhelmed with goats and sheep. I actually had to go out and count again how many we have. 2 eves, 3 baby lambs, 8 baby kids, one goat macho, 5 nanny goats and 2 (one sheep/one goat) still on the way. Good grief! Would you like to read more about our animal adventures? Check out Wascally Wabbits and Zombie Babies! I haven’t been able to share many animal antics lately because not much has been going on the Flores Ranchito. That all changed towards the end of November with the arrival of Zombie’s first offsprings, the Borrego Boys, white, fuzzy twins, who are healthy and fit with the exception of some sort of weird second set of eyes (but what can you expect from a zombie/sheep hybrid). 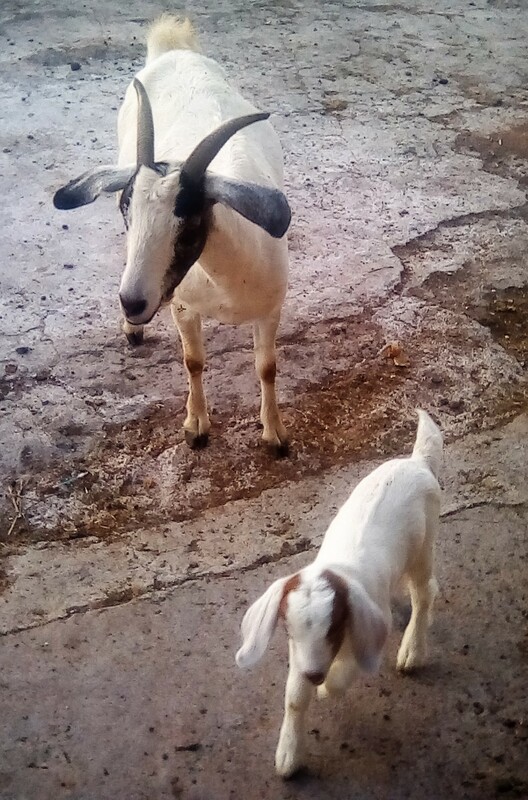 With their birth, my husband went a little crazy and started buying up pregnant goats hither and yon. Before we knew it, we had another set of white twins, the Chivo boys. Then La Gritona (Miss Shouter so named because of all her carrying on) gave birth very vocally one Sunday in the middle of one of my online classes. (Noise? What noise? Now, back to the difference between in, at and on.) Her little chivito is called Payaso (clown), since he’s often up to no good, knocking off the lamp, climbing the woodpile and so on. The next set of twins were born before my husband could seal the deal of the borrega/chiva exchange with the owner. So mama and twin boys, Salt and Pepper came to live with us in December. Fuzzy the sheep gave birth the next day to Zombeta, the first female offspring of the bunch. Fuzzy, a first-time mom, is quite the nervous Nellie. She doesn’t want to leave the corral without Zombeta, who really is too small to keep up with the herd/flock just yet, leading my husband on fun-filled romps around La Yacata in her efforts to get back to her little one. She also hollers throughout the day when Zombeta is out of sight, curled up with one of the other kids or lambs or just jumping about on the other side of the food trough. Zombeta’s birth brought our baby population up to 8 running, frisky little fellas in under 2 weeks. But the population explosion wasn’t done yet! The following week another little kid was born, Chiveta. 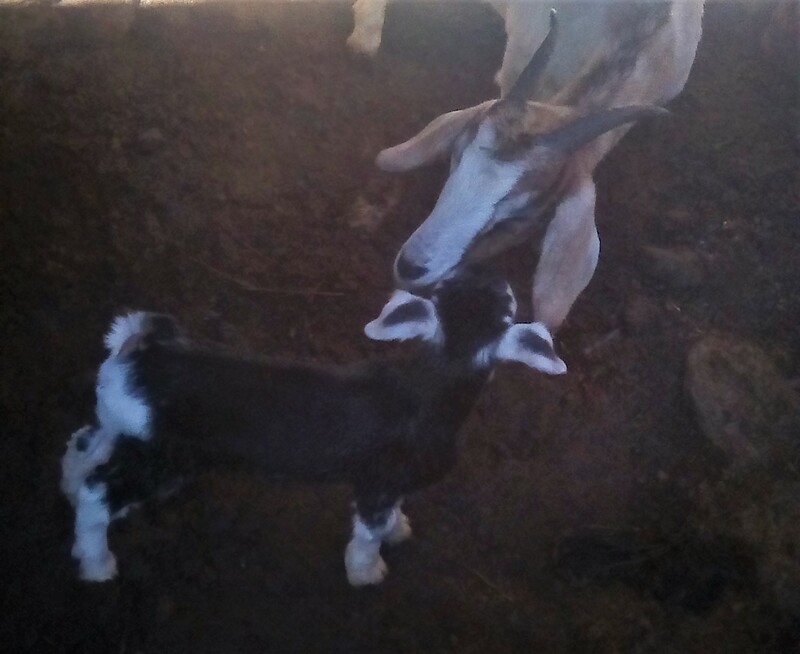 Of course, this was the only goat that my husband wanted a boy birth since the mama was a Boer goat, but alas, a girl. One sheep is still preggers but it will be a few months until she’s ready to give birth. I’d say we have our hands full as it is though, don’t you think? Do you want to read more about our animal adventures?